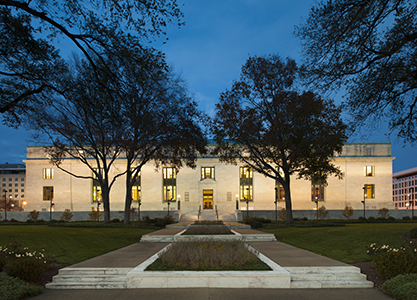 The National Academy of Sciences had no building of its own for sixty years after its founding. Its first meeting, in April 1863, took place in the chapel at the University of the City of New York (now New York University), and its subsequent meetings were held in various locations. In 1870, by a vote of its membership at its Annual Meeting, the Academy officially settled on Washington, DC as the location of its headquarters. The Academy may have found a home city, but it still had no building. An early, unrealized opportunity for a permanent home for the Academy arose in 1900 when the Washington Academy of Sciences attempted to raise funds for a building intended to be used by similar local societies, including the National Academy of Sciences. The original plan soon expanded into a grand project to construct a building for the scientific, cultural and educational societies of Washington. In 1913 Congress granted land on the Mall to be used for such a building, but the conditions attached to the grant — which called for a structure costing at least two million dollars and construction to commence within two years — could not be met, and the project was abandoned. Just prior to World War I, the federal government markedly increased its reliance on the Academy for advice on scientific and technical matters. The need for a permanent home became pressing in 1916 with the founding of the Academy's operating arm, the National Research Council, by Executive Order of President Woodrow Wilson. The Academy's building was to be realized through the efforts of NAS and NRC members, led by NAS member George Ellery Hale of the California Institute of Technology and by the generosity of the Carnegie Corporation of New York.